On Jan. 28, 1916, President Woodrow Wilson nominated Boston lawyer Louis D. Brandeis to the U.S. Supreme Court. One hundred years later to the day, Brandeis University will celebrate the centennial of his nomination with an appearance and remarks by kindred spirit Justice Ruth Bader Ginsburg. Afterward, a panel discussion kicks off a semester-long exploration of Justice Brandeis’ legacy. The panelists at the first event will include several noted scholars, including Philippa Strum ’59, who wrote the 1984 Pulitzer Prize-nominated biography “Louis D. Brandeis: Justice for the People” as well as this issue’s cover story, “American Sage." What could Brandeis — a man who lived roughly half his life in the 19th century and half in the 20th, and whose earliest memory was of a Union Army encampment outside his childhood home in Louisville, Ky. — have to say to 21st-century citizens? Brandeis died in 1941, seven years before his namesake university was founded. He didn’t imagine Brandeis University, but he surely inspired it. Even though Strum says the university did little to inform students about his legacy when she was an undergrad in the late 1950s, the larger-than-life bronze sculpture erected in 1956 on a rocky outcropping in the middle of campus was all the inspiration she needed. 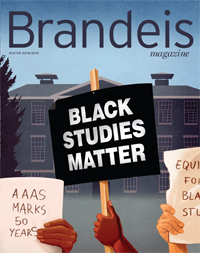 Six decades, four books and more than a dozen articles later, Strum is still fascinated by Brandeis. Just this week, I received her latest volume, “Speaking Freely: Whitney v. California and American Speech Law” (University Press of Kansas, 2015). Current Brandeis students are fascinated, too. Take Marc Siegel ’18, a double major in business and politics, with minors in economics and legal studies. Before college, he had no idea who Brandeis was. Then, last spring, he took a course with legal-studies lecturer Dan Breen that was devoted to Brandeis’ thinking on government, politics and law. Now the aspiring lawyer says he wants to practice law the way Brandeis did, looking at all sides of an issue and considering the best outcome for all. It’s a thoroughly Brandeisian question.